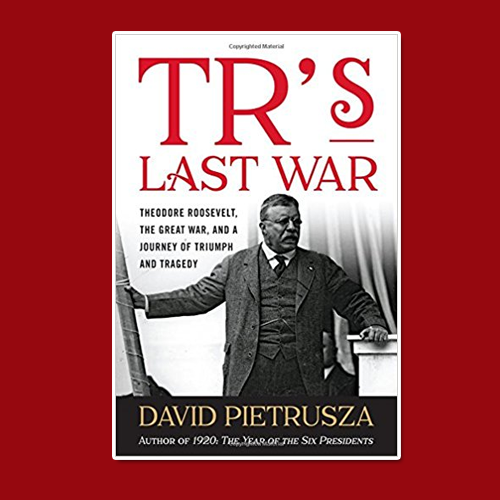 David Pietrusza returns with his new book TR's Last War: Theodore Roosevelt, the Great War, and a Journey of Triumph and Tragedy. David was here in July to tell the story of TR and his son Quentin, but this month he will talking about the whole book. From the publisher: “A riveting new account of Theodore Roosevelt’s impassioned crusade for military preparedness as America fitfully stumbles into World War I, spectacularly punctuated by his unique tongue-lashings of the vacillating Woodrow Wilson, his rousing advocacy of a masculine, pro-Allied ‘Americanism,’ a death-defying compulsion for personal front-line combat, a perilously rapprochement with GOP power brokers – and, yes, perhaps, even another presidential campaign….His own entreaties to don the uniform are rebuffed, …But his four sons fight ‘over there’ with heartbreaking consequences…Yet, though grieving and weary, TR may yet surmount everything with one monumentally odds-defying last triumph. Poised at the very brink of a final return to the White House, death stills his indomitable spirit. TR’s Last War unveils a sweeping epic not of a lion in winter but a Bull Moose bellowing at a blazing global inferno’s very gates – and ready for one final stampede in.” Bring your lunch if you are on lunch.